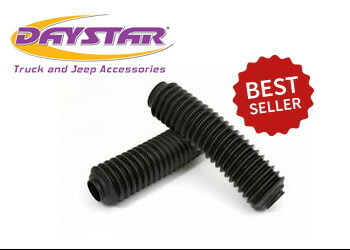 Daystar manufactures more shock boots than anyone else in the world period. Our highly specialized and automated manufacturing process guarantees consistent quality, fit, and finish. Manufactured in 14 different colors, Daystar Shock Boots protect the shock shaft and seal (or slip joint in driveshaft applications) from dirt and debris while adding color to your vehicle's undercarriage.